Next Program begins April 5 - June 28. Click for more events and retreats. Including events for professional training. Are you well nourished? – not just your body but your whole self? Or do you hunger for something more? What if we were living a life where we felt well nourished physically, emotionally, psychologically, intellectually, socially, spiritually, and creatively? 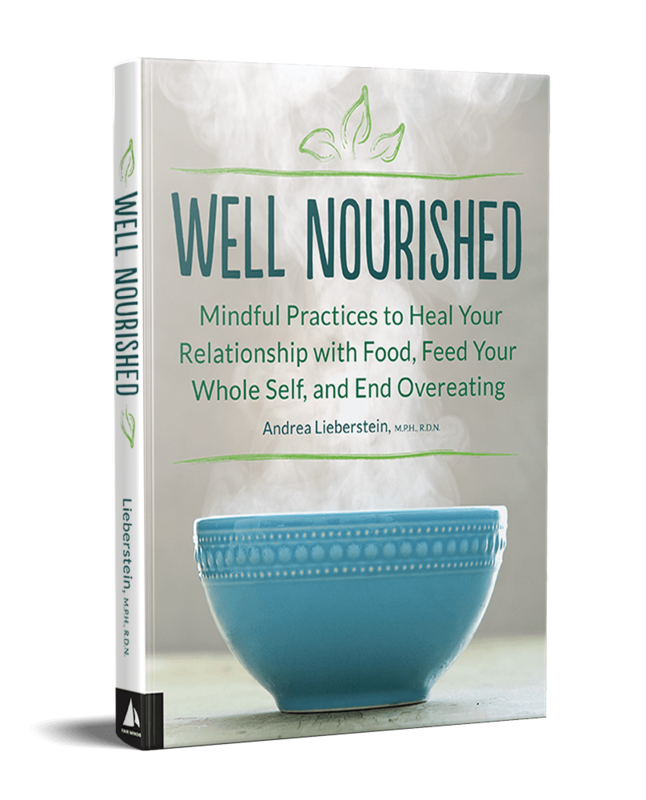 Well Nourished, the first book from internationally known teacher, trainer and coach Andrea Lieberstein, offers tools and practices for mindful eating so that you no longer have to turn towards food to find what you are seeking. With step-by-step examples, tools, beautiful illustrations, meditations and mindful practices that can be individualized to your own unique needs, the book helps you get on track to living a balanced, happy and well-nourished life. Order the book to begin the journey! GET A FREE CHAPTER FROM THE BOOK! Thanks for signing up! Check your email for your free chapter. Already A Well Nourished Reader? Claim your FREE book support tools here. This is a wonderful book that integrates a practical and inspiring path to nourishing the whole self, honoring mind, body and spirit. Clear tools and mindful practices based on scientific research, wisdom practices and Andrea’s expertise are offered throughout that if followed open the door into living a life that is nourished, fun, resourced and whole – with food in its place as a source of nourishment not struggle. This book is medicine for your soul. It will take you on a journey exploring the different aspects of your self, showing you how to receive deep nourishment and be happy from the inside out. The clear, powerful practices give you tangible ways to balance and nourish your own life and, through your own fulfilled life, help nourish the world. Andrea Lieberstein’s book helps the reader with an essential task – realizing the full potential of their life. This workbook guides us through an assessment of eight realms in our life that require “nourishment” through mindful attention. These include the realms of the physical, emotional, psychological, social intellectual, creative, spiritual and worldly. Through her clear writing, stories, science-based practices and creative exercises the author guides the reader in forming a plan for a life that is well rounded, well nourished and personally satisfying. Well Nourished is a rich and comprehensive guidebook that not only helps the reader establish a healthy relationship to food, but uses it as a vehicle to greater experience consciousness, mindfulness and true fulfillment in all areas of one’s life. As a result it allows your goodness to shine through and help awaken it in those around you. An excellent offering. Andrea Lieberstein’s Well Nourished is a delightful feast combining behavioral science research, practical exercises, and a heathy dose of personal and professional experience. She has crafted a sensible and compassionate guide to nourishing yourself in body, mind and spirit. ~ David S. Sobel, MD, MPH, former medical director of Patient Education for Kaiser Permanente Northern California. Author of “Healthy Pleasures”. The Well Nourished Mindful Eating and Living approach helps you release your struggle with food so you can reclaim your full energy, joy, sense of purpose, contribution and passion to lead the life you dream of living. – The mindful eating and living practices and tools we teach help you to change your relationship with food to that of true nourishment and pleasure and get back on track to living a fulfilling well nourished life. -You will also have more energy and clarity to make your unique contributions to the world and truly shine. Regain your passion, perspective, and joy for life when you learn how to have a mindful relationship with food and follow the steps to living a well nourished life. What you’ve longed for, and know is possible, can become your reality. Discover the eight realms of yourself and life that need nourishment to truly thrive. When you take the plunge and step into the deep pool of nourishment that is possible, you’ll discover the deepest nourishment that is the source, and uplifts all of your well nourished life. – Hope Sasek M.A., R.N. Andrea supports you to have greater empowerment, peace, joy and balance in your life and life choices through vibrant Well Nourished mindful eating and living. 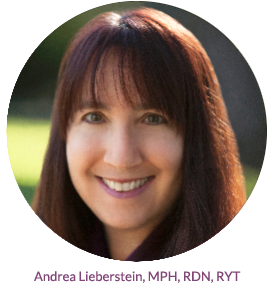 A mindfulness expert and registered dietitian nutritionist, Andrea Lieberstein has over 20 years of experience that she shares through Well Nourished and brings her unique expertise in mindful eating and well nourished living. A speaker and leader of mindful eating and well nourished trainings and retreats for professionals and the general public, Andrea incorporates innovative mindful eating and mindfulness-based mind-body practices in her international online and in-person private practice with individuals and groups working on a wide range of nutritional and lifestyle challenges from disordered eating to body image to healthy weight management and mindful living. 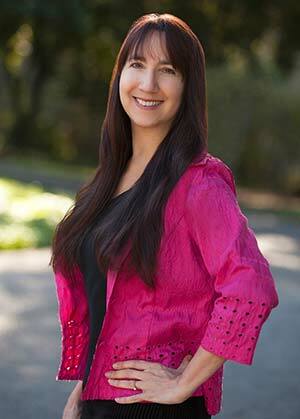 She spearheaded Mind Body programs at Kaiser Permanente Northern California centers for many years and has degrees from Stanford University and the University of California at Berkeley. She is author of the new book, “Well Nourished”, and a contributing author to “Resources for Teaching Mindfulness: An International Handbook, and the “The Relaxation and Stress Reduction Workbook” (5th edition).